Binary options – is it betting or trading? A debate that has been raging ever since binary options exploded onto the market, sweeping away convention, tearing up the rulebook, and dividing opinion. Indeed, simply mention the word binary and instantly a heated debate will ensue. But love them or loathe them, binary options are here to stay, and Binary Options Unmasked has been written to provide traders with a balanced and considered view of these deceptively simple yet powerful instruments. There are many traps for the unwary, but there are also some solid gold nuggets, if you know where to look. So are binary options for me? This is the question I hope will be answered for you in this book. In writing it, I have tried to provide a complete introduction to the subject, with practical examples of how to approach these innovative instruments. Every aspect of this market is explained – both the good, and the bad. Nothing is left unsaid. Binary options have much to offer, and used with common sense and thought, are perfectly valid trading instruments. Applied unthinkingly, they become like any other instrument – a quick way to lose money fast. 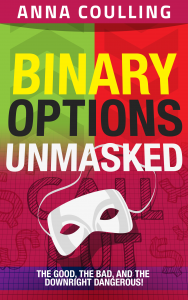 Binary Options Unmasked reveals the true characteristics of this market. It covers the current market participants, along with their product offering. Moreover, not only are binary options explained in detail, but their application as a trading instrument is also illustrated. Trading strategies and approaches too are explored, along with an innovative and practical approach to interpreting volatility, a key component of any options trading. I hope this book, will give you the confidence at least to consider these instruments in more detail for yourself, with an open mind and your eyes wide open.